How do you edit a post? I've tried clicking "More", but nothing happens. I'm not sure if this is a browser issue or a site issue. 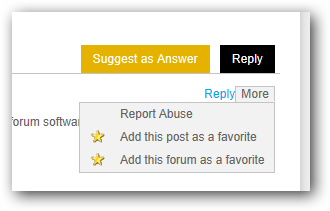 You could edit your forum post by clicking on the 'More' menu => 'Edit'. I tested this with three different browsers and it seems to work fine. I suggest you to clean your cookies and/or reload the page of the forum thread in which is the post you want to edit and try again. Please do not hesitate to ask if something comes up. To edit a post, first you need to log in again then in right-most or left-most corner you will see option 'edit', click on it and edit then click 'update'. Still not working then site must be banned you for editing post. I'm still unable to edit any posts on here, even with the forum software refresh. There is no edit option on the "More" menu on IE9 running on Windows 7 x64. I've just tried using Chrome as well and same effect. Just the following options under the "More" menu.